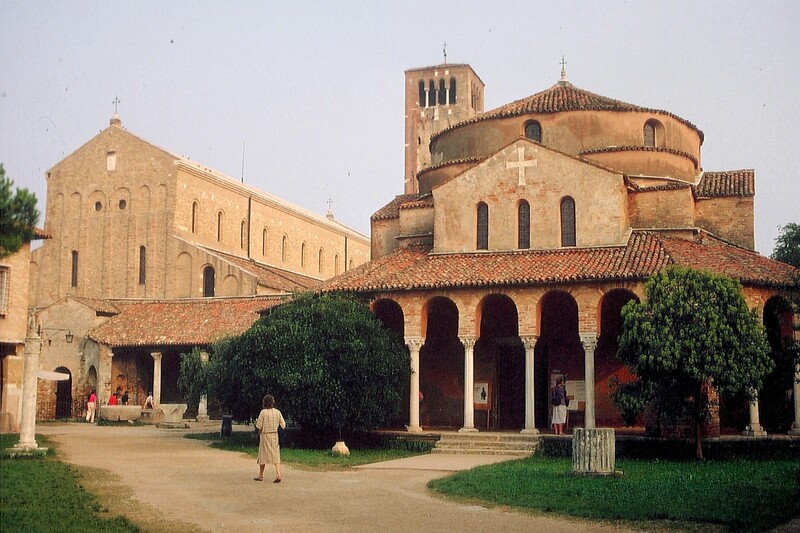 One of my favourite basilicas is not found in Rome but rather in the north-eastern part of Italy on the small island of Torcello; small in size and population but large in its pedigree, having been the seat of a bishop by 638 A.D.\. The corresponding cathedral basilica of this ancient seat is that of Santa Maria Assunta which was founded a year later in the year 639 while the (Byzantine) Emperor Heraclius reigned -- a point noted on an inscription in the apse. 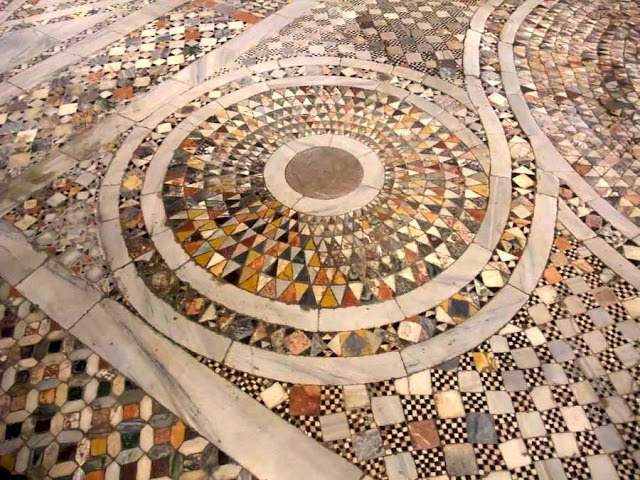 The basilica includes Byzantine artistic elements, particularly in the form of mosaics dating from the 10th-12th centuries. and the entire structure is a marvellous example of the early Christian basilica form which has aspects both Eastern and Western. 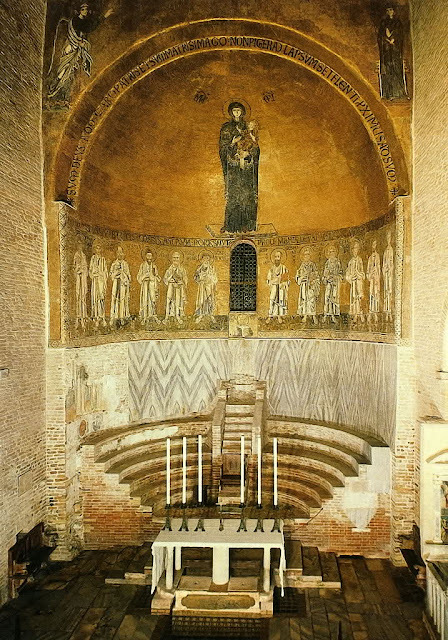 There are any number of features of interest in this basilica but what particularly interests me is the remarkable sanctuary and apse. Seen here is the high altar of the basilica. Readers will also take note, of the presence of the cathedra, dramatically raised up above the rest of the sanctuary and around it benches intended to serve as seating for the bishop's 'liturgical court." This feature is known is a synthronon -- a feature that first developed in the 4th century. The arrangement of the cathedra may strike some as odd, particularly in the light of the understandable, critical reaction to many of the sanctuary re-arrnagements of the past few decades, but the episcopal character of this arrangement must be remembered and arguably differentiated from others of a non-episcopal character. 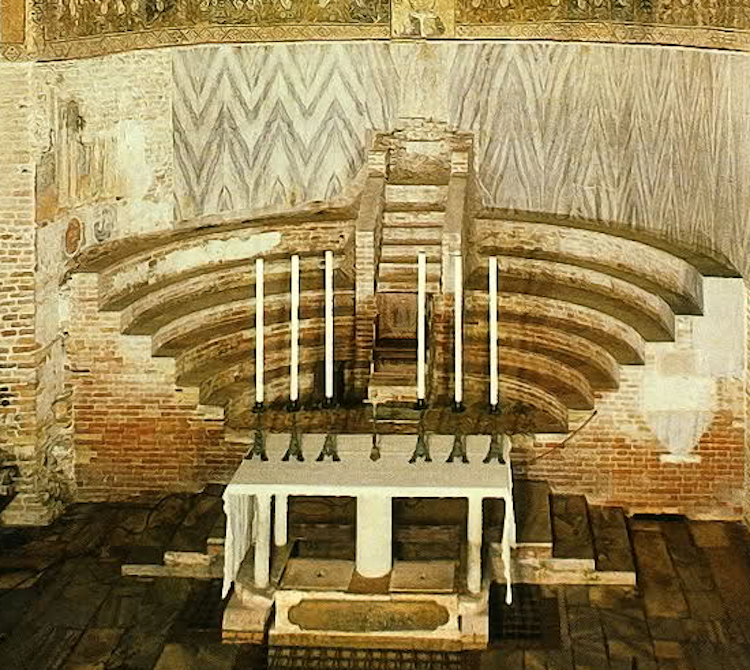 The altar itself takes an ancient form and is very well proportioned to this basilica. 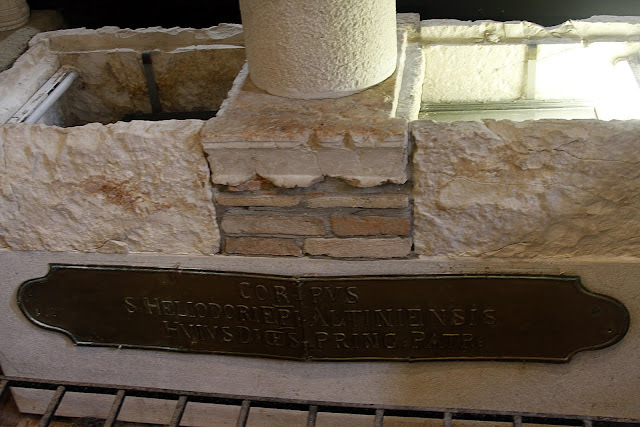 One will note the presence of the confessio just before the altar which look down into the crypt below which contain the relics of St. Heliodorus, the 4th century bishop of Altino. 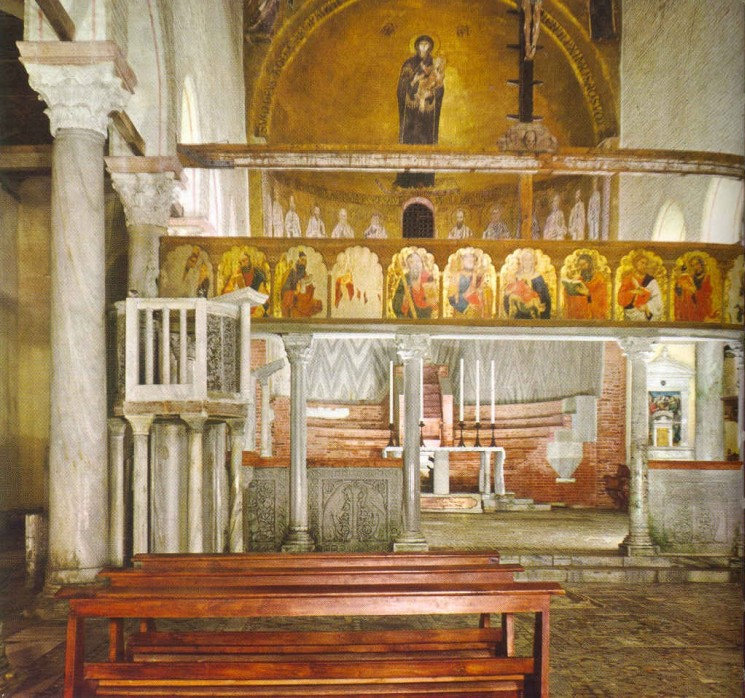 As we step back from the sanctuary and into the apse, one will note the balustrade which various icons of saints, surmounted by the large crucifix. This serves to both separate the sanctuary from the nave and also nicely frames the high altar. From this view one will also note that despite the prominence of the cathedra, the altar yet remains the primary focal point. Before the balustrade is an impressive ambo in the full ancient style for the proclamation of the gospel. Turning our gaze upward toward the apse, we see the Madonna and Child, set against a golden backdrop. Images of (presumably) the twelve apostles also appear below and above, the annunciation. One can just make out here the inscription noted earlier. 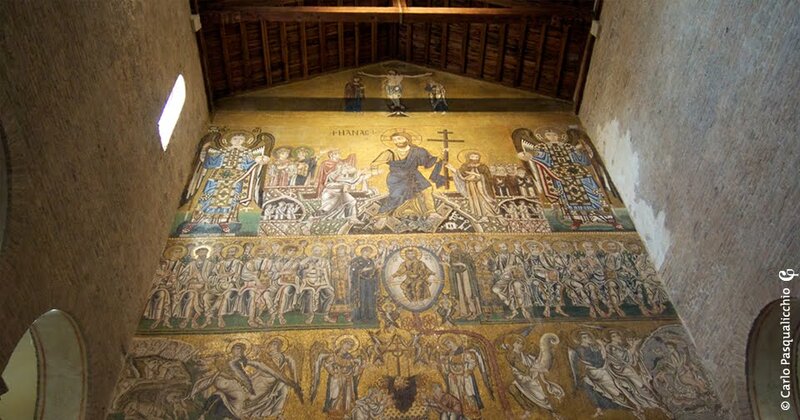 If we turn our gaze away from the altar and sanctuary, toward the narthex, we see another great mosaic image; that of the Last Judgement. 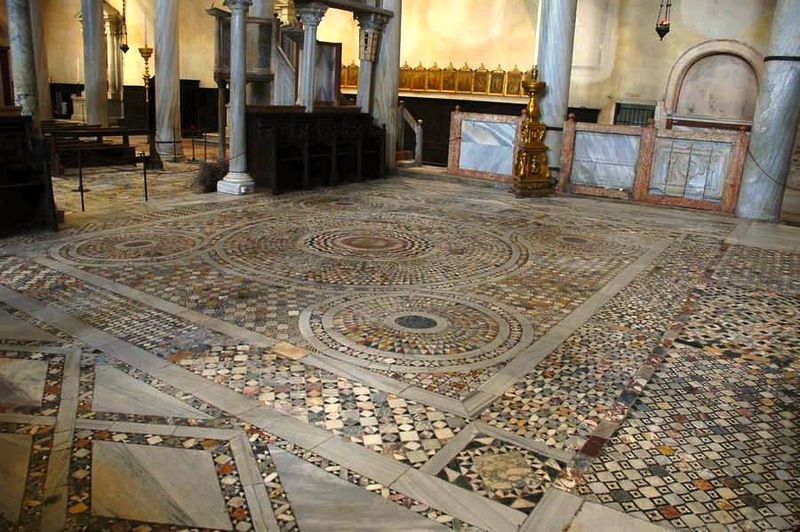 There is something poignant here in the placement of this mosaic at this end of the basilica, leading out of the church and toward the world, versus the apse and sanctuary at the other end of the basilica I think. 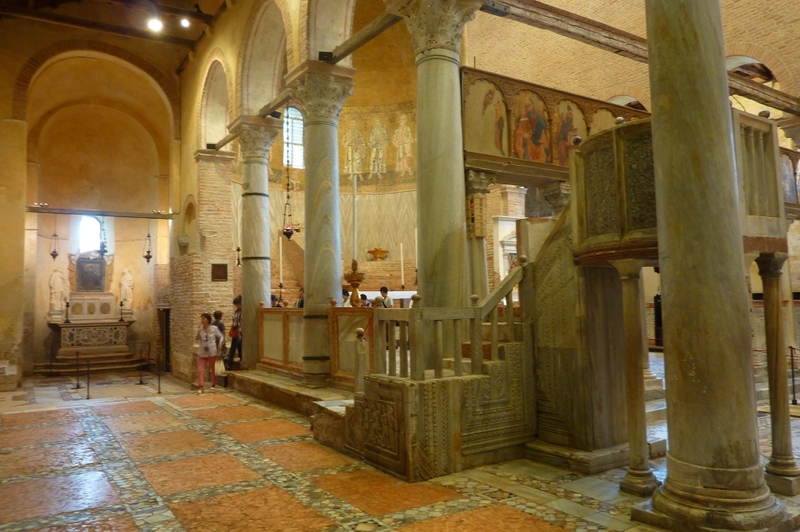 Finally, here are a few more details of the basilica, beginning with the outer structure itself.